On the second day of the Space Coast Birding and Wildlife Festival I wasn’t scheduled to lead any field trips. Rather than sleep in or do some other foolish thing like that I did what any self-respecting birder from New York who finds himself in Florida would do: I went birding! In particular, I headed south, to the T.M. Goodwin Waterfowl Management Area, which is open to vehicles not driven by hunters on Mondays and Thursdays only. Fortunately for me the second day of the festival, 22 January, was a Thursday, which meant I could drive the many miles of road through the amazing habitat. But I’m getting way ahead of myself here. Because, just to access T.M. Goodwin, you need to drive several miles down Fellsmere Grade Road, a gravel road that parallels the border between Brevard County and Indian River County. I arrived at Fellsmere Grade Road predawn and drove slowly, listening to Yellow-rumped Warblers chip, Carolina Wrens sing, and Red-shouldered Hawks yell. Then a lump on a bare tree caught my eye and slowed to stop. 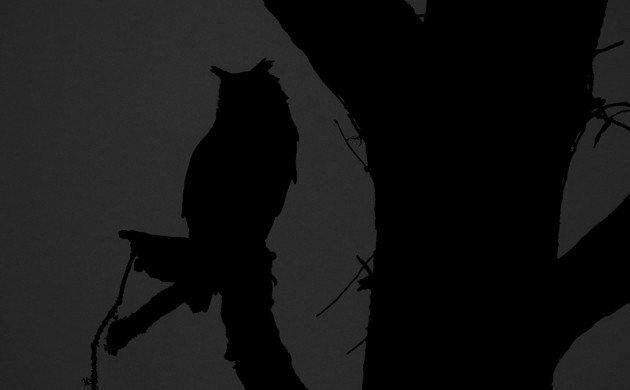 Astute readers, er, well, readers with any brain activity at all, will probably have realized by now that the lump was a Great Horned Owl! Though it looks obvious in this image it actually would have been really easy to miss this bird. I got out of the car and watched the owl for awhile. A second bird would hoot from cover and the one in view gave single notes in response. It was great to watch an owl in the wide open through the scope which gathered what little light there was very well so that I could distinguish every plumage detail. Unfortunately, the lack of light made digiscoping very tough but I did manage to get a passable image or two. The ISO was cranked way up to get this shot but it was worth it. Then I had the genius idea to shoot some video! So I did. Sadly, I lack a good microphone so you can’t hear the owls but you can see essentially what I was seeing. And who doesn’t like video of an apex predator? I would have stuck around longer and kind of regret that I didn’t but I was on a mission to find a Fulvous Whistling-Duck, which was a life bird just waiting for me at T.M. 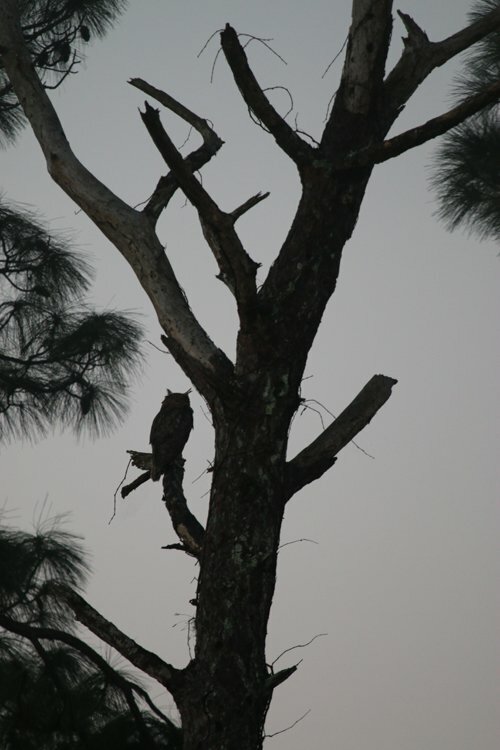 Goodwin, so I left the owl to its hooting and continued to the west down Fellsmere Grade Road, happy for having had an excellent owl experience. 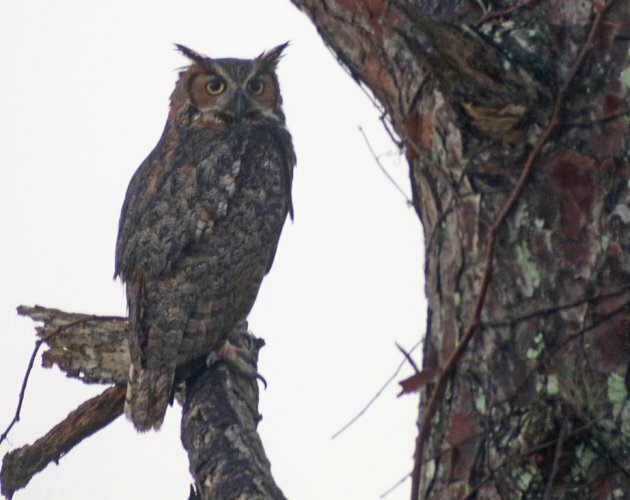 If you liked these images of a Great Horned Owl and want to see more great images of birds make sure to check out 10,000 Clicks, our big (and growing) page of galleries here at 10,000 Birds. 10,000 Birds is a Scrub Jay-level sponsor of the 18th Annual Space Coast Birding and Wildlife Festival. Love the video that shows his swiveling head movements! He seemed to look right at the camera. Thanks! Where Are You Birding This Second Weekend of June 2017?